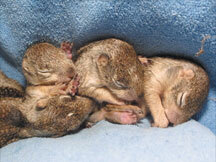 Each year WildCare treats over 100 squirrels of various species. 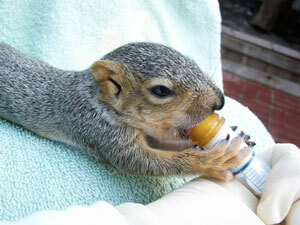 Orphaned squirrel babies are fed special formula developed to approximate their mother’s natural milk. They are weighed daily to be sure they are thriving on the substitute formula. These little babies need around-the-clock care and a comfy hammock or blanket in which to snuggle. Once their eyes open they need a varied diet and a safe place to play! put to work to help your sponsored babies! $25 could purchase a heating pad to keep your sponsored babies warm. $50 could buy a colony of mealworms to provide necessary protein and nutrients for your babies. $100 could buy a quality gram scale to help caregivers make sure your babies are healthy and gaining weight. $250 could buy an incubator or brooder to keep the tiniest babies warm, safe and comfortable. $500 could build strong, secure caging to ensure a safe place for your babies to learn to explore and grow. Check this option if this gift is in honor of someone special. If this box is checked, additional fields will appear. * Honoree Address City: Required Notification recipient city is required. * Message Body: Required Message body is required. This message will be sent to the notification recipient. Yes, I would like to receive periodic patient stories and updates from WildCare. If you have any questions about donating to us online, please send us an email or call us at 415-453-1000 x13. To send your gift by U.S. Mail, please make your check payable to WildCare and mail it to WildCare, 76 Albert Park Lane, San Rafael, CA 94901. Thank you! Each wildlife sponsorship is symbolic and your donation will be used where needed most to help ill, injured and orphaned wildlife.